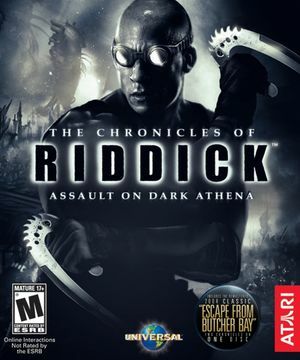 Includes a remake of The Chronicles of Riddick: Escape from Butcher Bay. The game is very unoptimized for anti-aliasing, recommended to disable it if you have performance issues. All Windows versions except the retired GOG.com edition have TAGES DRM. After activating the game for a third time, TAGES will start a 30-day timer. After 30 days an activation will be restored up to the original total of three activations. Download from Mod DB or The Patches Scrolls. Patch 1.01 is available for Windows and OS X. An alternate download for Windows is available on Mod DB. Warning: this is not needed for the GOG.com version, it will also try to install/update the TAGES DRM driver. Delete or rename atari.ogg, Intro.ogg, Sbz.ogg, Tigon.ogg, and universal_ntsc.ogg. Always a good idea to make a backup of this file, if you change your mind. Press F5 to save and F8 to load. The key bindings are lost when you quit the game. Use ↓/↑ in the console for quick access to your recent commands. The game uses F9 to load the most recent save by default. The commentary mode from the original EFBB can be added via DLC. By default it will only be available after completing the EFBB campaign for the first time. Install the DLC from Mod DB or The Patches Scrolls. You can toggle the commentary mode with a switch in the game options. Anamorphic by default; see Widescreen resolution. Only 2560x1080 appears to be supported. Higher ultrawide resolutions cannot be used. FOV is increased when in stealth mode. Resolution is reduced in windowed mode (e.g. 1920x1017 rather than 1920x1080). Appears as "Anisotropy" in a percent setting. MSAA and CSAA, up to 32x. Turning on AA automatically disables SSAO and vice versa. The game is very unoptimized for anti-aliasing, recommended to disable it if you have performance issues. Refresh rate can be set up to 144 Hz in graphics options. A bug may result in it being reset to 23 Hz when you re-launch the game. See Incorrect refresh rate every time game is launched. Non-16:9 resolutions are letterboxed by default. If you're letterboxed on a 16:9 resolution, open Environment.cfg (located in %LOCALAPPDATA%\Atari\The Chronicles of Riddick - Assault on Dark Athena) and make sure that VID_DWIDTH and VID_DHEIGHT are set to the correct values. Launch the game via the loader. If the loader doesn't work for you then copy files from this archive to the same path. Turn on Anti Aliasing in the graphics settings. Enter xr_ssao 1 (values 1-3 enable Ambient Occlusion). The setting is not saved when you quit the game. Use ↓/↑ in the console for quick access to the command so you can easily reapply it next time you're playing. Supports adjusting the sensitivity for both axes separately. It only affects the GUI, menu and subtitles. Run DarkAthena_Launcher.exe with text editor. You can change to another language by clicking the flag icon at bottom right of the launcher. It overrides the language selected in the configuration file. Open Environment.cfg with text editor. Locate the line LANGUAGE=ENG and change the value to FRE, GER, ITA or SPA. Save files will delete themselves if the game is left running and your computer goes into screen saver mode. To avoid this, remember to quit the game before leaving it unattended or disable screen saver mode. The game may fail to change the desktop resolution back to the previous one (by default it launches at 640x480 fullscreen). Create the configuration file location if it doesn't exist. Open it and create a file called Environment.cfg. If you're running Windows 7/8/10 and the game window doesn't fit on your monitor when in full screen mode, you may need to lower the scaling on font size. Display Settings > Change the size of text. Open Environment.cfg (located in %LOCALAPPDATA%\Atari\The Chronicles of Riddick - Assault on Dark Athena) and make sure that VID_DWIDTH and VID_DHEIGHT are set to the correct values. ↑ 1.0 1.1 File/folder structure within this directory reflects the path(s) listed for Windows and/or Steam game data (use Wine regedit to access Windows registry paths). Games with Steam Cloud support may store data in ~/.steam/steam/userdata/<user-id>/9860/ in addition to or instead of this directory. The app ID (9860) may differ in some cases. Treat backslashes as forward slashes. See the glossary page for details.